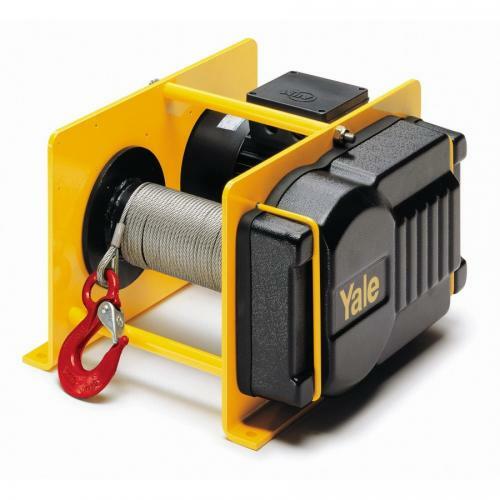 The Yale wire rope winches have been specifically designed and engineered for maximum safety, performance and efficiency and also boast a number of options and advantages. They allow for individual applications in almost any position thanks to its practical & compact cube design. 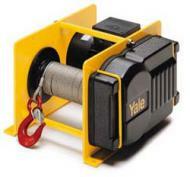 This makes them an essential aid for lifting and pulling loads. The units come delivered with a certificate of conformity showing the units serial number along with and operating instruction manual containing the manufacturers CE declaration. 400V 3Phase 50hz 3phase motor protected to IP54 standard & insulation class F.
Spring pressure disc brake incorporated in the motor - meaning this winch will hold the load even in the event of a power failure! The rope supplied is secured to the drum in a recess meaning the rope can be wound around the drum in several layers without causing damage. Features a spur gear transmission with helical first gear ensuring a smooth and easy motion. This is lubricated by grease meaning it can be used in any position. 42V Low voltage pendant control (inc. push button with emergency stop & 2m cable) is supplied as standard.